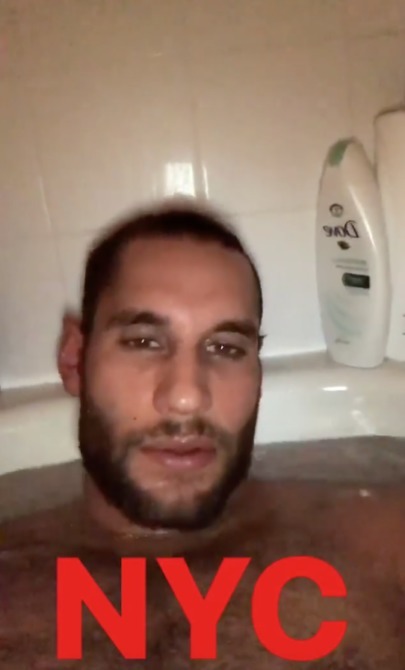 In 2016 we told you about Franco Noriega, a Peruvian chef and former pro swimmer who first caught our attention by whipping up some chia pudding in some very short-short short-shorts. Well nobody expects him to stay covered up like that all the time–this isn’t Puritanical Salem–sometimes you have to let it all hang free. Or in this case, float free. Noriega turned virtual heads across Imgur this week when a particularly revealing clip from his story made its way to the masses. “NYC” the caption reads, but we’re less concerned with the location of the tub as we are what’s soaking in it. Head here for the blink-and-you’ll-miss-it work-un-friendly moment. Nothing accidental with that shameless self-promoter. Career must be a little rocky if he’s leaking partial crotch shots. OH Yeah. Tone-on-tone striped sheets, window-blind shadows, and HEAVILY raked ab-shadows. I’m IMPRESSED! It’s like you can almost see the hand of God forming the finger-lakes region of central NY at the moment of creation…. Oh the thirsty queens at Queerty.com. This was laughable. But hey, every article can’t be stellar! Peruvian?? With that Gringo face? ?